Try the bra on and adjust the straps to the correct length. If you just them later, you’ll end up with a funny looking spot on the back that doesn’t have paint! Apply the paint in short bursts and layer it on slowly to avoid unsightly drips and stiff fabric that’s crunchy from all the paint. 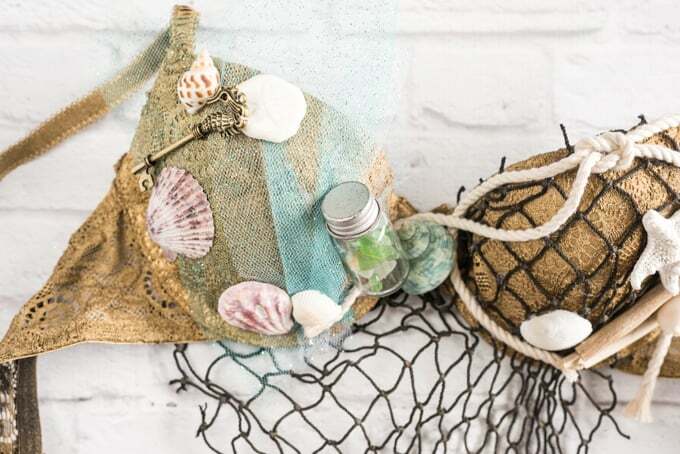 Mermaid Bra Tip #2 – Think outside the box when gathering supplies. 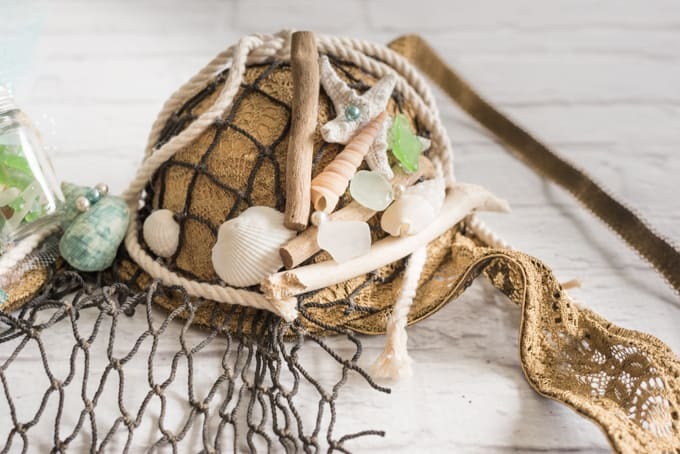 Don’t just pick out shells and plastic pearls – look around for more unusual adornments like flowers, rope, twine, driftwood, net, tulle, and even charms. Remember that you don’t have to add every single thing you find, so go ahead and gather a lot of fun things together for inspiration before you start gluing! 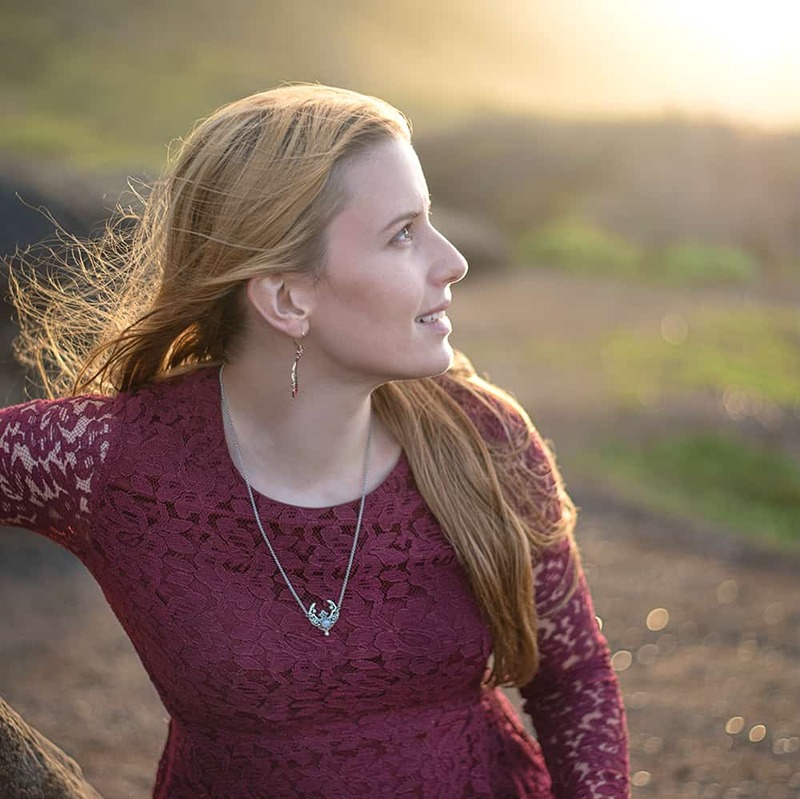 Mermaid Bra Tip #3 – Plan your creation. Before you break out the hot glue, plan. You won’t be able to put every single thing in its place before adding some glue, but try to have at least a fairly good idea of what you want before you start gluing. I returned to this step over and over – I’d plan, glue on a few elements, then plan some more before gluing on additional pieces. 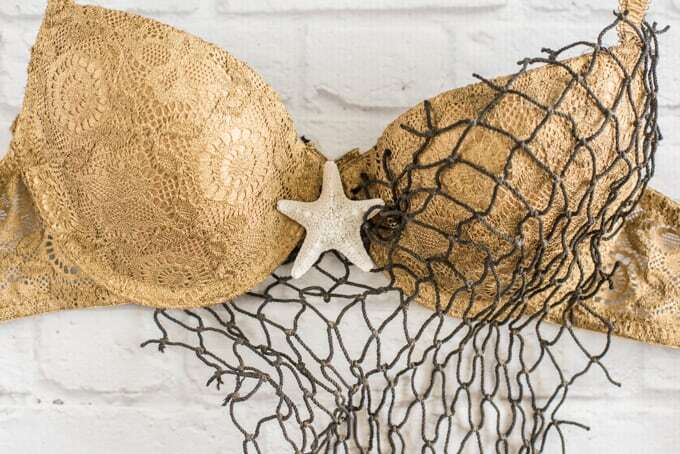 I originally wanted to put this starfish in the middle, but I realized it wouldn’t work well when I put the bra on. Good thing I didn’t just glue it in place right off the bat! 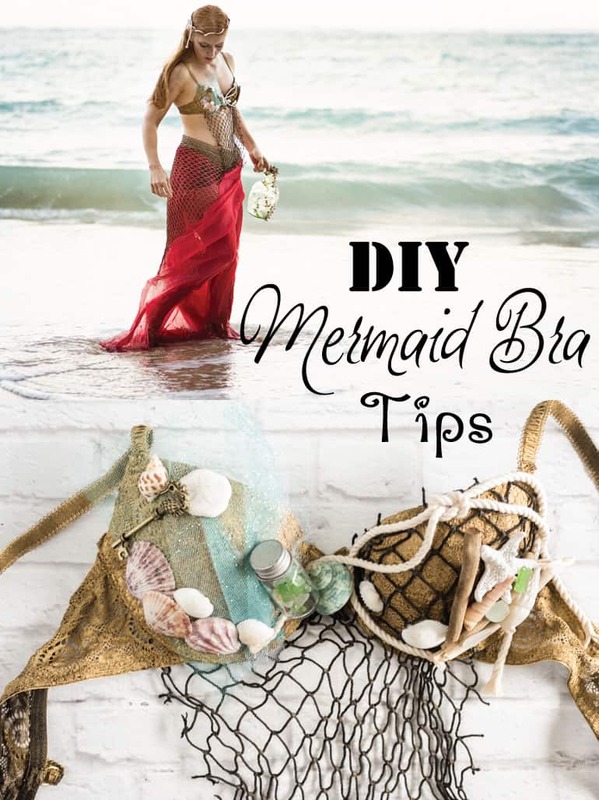 Mermaid Bra Tip #4 – Remember that you’ll have to wear it! At least, I’m assuming you plan to wear it. Try not to place elements that are likely to stab you in the chest or under the arms. Speaking of stabbing in the arm – that light colored piece of driftwood did stab me in the arm a bit. I knew it would and attached it anyway because I liked it, but I have to be careful to keep my arm out a little when I wear the bra. Mermaid Bra Tip #5 – It’s okay to add items to the straps and band, but remember that these pieces need to stretch. If you glue something really large to the straps or bands, it may pop off when you put the bra on. Mermaid Bra Tip #6 – Consider using high temp hot glue. You have to be more careful not to burn yourself, but high temp glue tends to be more permanent. Look for a “mini” high temp glue gun like this one because it’s way easier to handle than a large one. Now go out and mermaid! Have you ever dressed up as a mermaid? Or made some other decorative bra as part of a costume? I am found to an event at a winery and the theme is mythical creatures. So why not celebrate as a mermaid. Now to dig through my bras and see what could work and head to the dollar store. Mermaids are definitely not only for Halloween. Awesome! I hope you have fun at the event – it sounds really enjoyable! Thanks for stopping by! This is gorgeous!! Maybe I’ll quit my job and go be a mermaid full time instead! So….there are people who do it! There are full time mermaids. Most of them have these fancy silicone tails that cost thousands, but there are actually ‘professional mermaids.’ I kid you not! People do birthday parties and meet and greets and stuff like that. Career change?